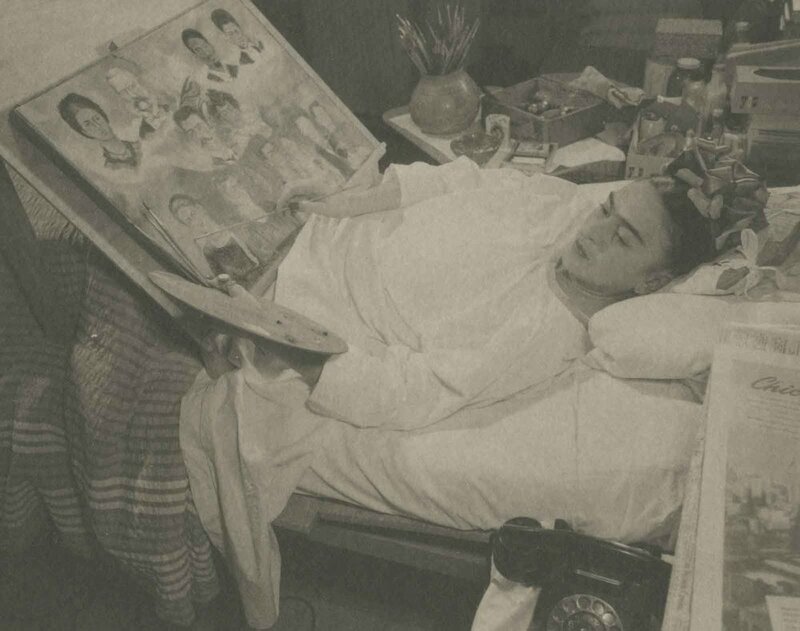 Juan Guzman, Mexican (Cologne, Germany, 1911 – 1982, Mexico City, Mexico), Frida in Hospital, Painting, circa 1930s, platinum print, printed by Ava Vargas, 3 ¾ x 4 ¾ inches. Courtesy of Throckmorton Fine Art, New York, New York. Nickolas Muray, American (Szeged, Hungary, 1892 – 1965, New York, New York), Frida Kahlo on White Bench, New York (2nd Edition), 1939, color carbon print, 19 x 14 ½ inches. Courtesy of Throckmorton Fine Art, New York, New York. Diego Rivera, Mexican (Guanajuato, Mexico, 1886 - 1957, Mexico City, Mexico), Frida Kahlo and Emmy Lou Packard, Coyoacán, Mexico, 1941, platinum print, 10 ½ x 10 ½ inches. Courtesy of Throckmorton Fine Art, New York, New York. LITTLE ROCK, Ark. – The Arkansas Arts Center presents a rare opportunity to see one of Mexico’s greatest painters captured by some of the 20th century’s most important photographers. Photographing Frida: Portraits of Frida Kahlo/Fotografiando Frida: Retratos de Frida Kahlo will be on view at the Arkansas Arts Center February 1 through April 14, 2019. Photographing Frida: Portraits of Frida Kahlo features 65 images of Kahlo as art and artist. The photographs document Kahlo’s life as seen by some of the greatest photographers of the time – Lola and Manuel Álvarez Bravo, Imogen Cunningham, Emmy Lou Packard, Graciela Iturbide, Nickolas Muray, and Edward Weston, among others. From casual snapshots to intimate family photographs to artfully posed studio portraits, viewers will see the full spectrum of Kahlo’s life, from self-assured adolescent, to influential artist, fashion icon and passionate lover, as she takes on a mythic presence in our collective imagination. In the hands of photojournalists, friends and artists, the camera allowed Kahlo to explore her own image and identity, document her marriage to the great muralist Diego Rivera, express her strong political views, and artfully reveal her life-long struggle to overcome her physical challenges. In the process, she ultimately defined the principal subject of her own art – herself. Frida Kahlo was born in Coyoacán, Mexico City, Mexico in 1907. Her father, Guillermo Kahlo, was a photographer, and often photographed the young Frida. Through her father’s portraits, she became acquainted with the power of her own image. Kahlo’s short life was punctuated by struggles with physical ailments. She was born with spina bifida, a congenital spinal condition that affected her health throughout her life. She contracted polio as a child, which left her right leg shorter and weaker than the left. At age 18, Kahlo was severely injured in a near-fatal bus accident, fracturing several ribs, both her legs, as well as her collarbone and pelvis. The effects of the injuries lasted a lifetime, informing her art and the identity she honed through photography. In 1929, Kahlo married muralist Diego Rivera. Throughout their tumultuous marriage, the couple was often photographed together, both in Mexico and in the United States. Rivera was a major presence, both in Kahlo’s life and in the photographs that document their life. As they traveled through Mexico and the United States, “Frida and Diego” – as they were affectionately known – became a source of fascination and intrigue for the paparazzi: Kahlo, stunning in her Tehuana dresses, beribboned hair and beaded jewelry, accompanied her famous muralist husband. Photos of their second wedding (the couple divorced in 1939, only to remarry a year later) in California were captured by American press photographers. The exhibition reveals Kahlo’s fascination with fashion – as self-expression, political expression, and a means for concealing her physical disabilities. She was often photographed wearing traditional Mexican clothing – Tehuana dresses, huipils and rebozos, and beaded jewelry. Under the voluminous skirts and flowing dresses, she was able to hide the injuries that had affected her since youth. The pre-Hispanic clothing she often wore allowed her to express her belief in mexicanidad – the nationalist movement that found its inspiration in pre-Columbian Mexico after the end of the Mexican Revolution. 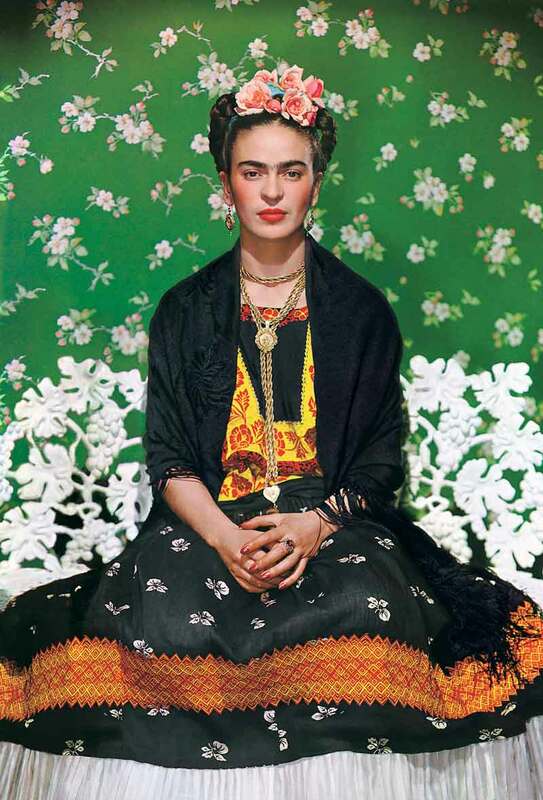 Kahlo continued to be photographed until her death in 1954. To each photographer she encountered, she became something new – ever present and continually beguiling – but made different through their lens. In the process, she herself became a work of art. Photographing Frida features images by Lola Álvarez Bravo, Manuel Álvarez Bravo, Florence Arquin, Lucienne Bloch, Imogen Cunningham, Gisèle Freund, Hector Garcia, Juan Guzman, Graciela Iturbide, Peter Juley, Guillermo Kahlo, Bernice Kolko, Leo Matiz, Nickolas Muray, Emmy Lou Packard, Victor Reyes, Bernard Silberstein, Edward Weston and Guillermo Zamora. A fully-illustrated catalogue, Mirror, Mirror: Portraits of Frida Kahlo, featuring an essay by Salomon Grimberg, a noted authority on Latin American art, accompanies the exhibition. Photographing Frida: Portraits of Frida Kahlo/Fotografiando Frida: Retratos de Frida Kahlo is organized by the Arkansas Arts Center in collaboration with Throckmorton Fine Art, New York, New York. The exhibition is sponsored by Bank of America; JC Thompson Trust; Judy Fletcher, In Memory of John R. Fletcher; Belinda Shults; Laura Sandage Harden and Lon Clark; Holleman & Associates, P.A. ; Barbara House; and Rhonda and Tim Jordan. Additional support by Consulate of Mexico in Little Rock. artGuidemag is the top Arkansas gallery guide and art guide for art galleries in Arkansas. With a comprehensive, top Little Rock gallery guide and Little Rock art gallery directory, Little Rock art lovers will find no shortage of Little Rock art, Little Rock art galleries, as well as art museums in Little Rock. Be sure to use the top list of art galleries in Little Rock.